The Government of Rwanda has issued RwF 15billion 7 year fixed Treasury bond. This is part of a Government’s comprehensive Treasury bond issuance plan for Fiscal Year 2014/2015. It follows a successful 5-year bond issued in August 2014 which was oversubscribed by 232 per cent signaling investor confidence in the outlook for Rwanda’s currency and economy. ERROR: Content Element type "youtubevideo_pi1" has no rendering definition! The interests are paid to you by the National Bank of Rwanda on behalf of the Government of Rwanda. The Tresury bond holder can also use it as colateral to acquire other financial facilities. The also enjoy the capital market taxe incentives. 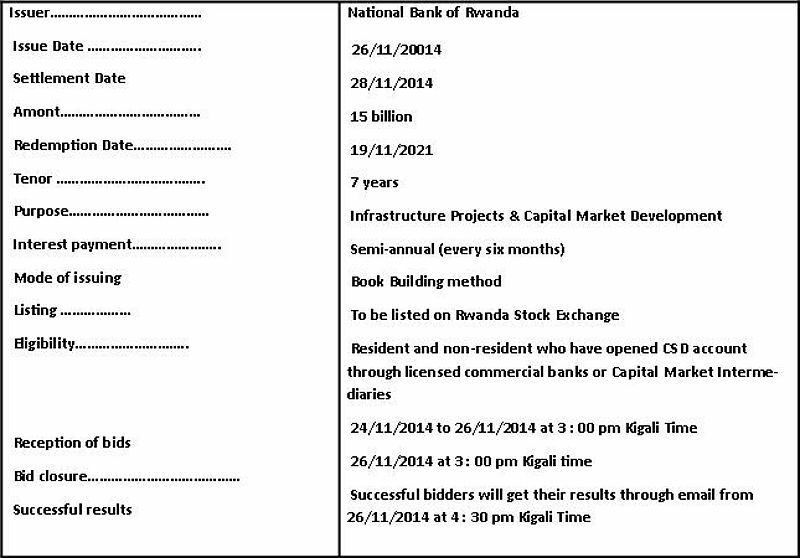 You can sell your bond any time at the secondary market of the Rwanda Stock exchange. What is your main reason for visiting the CMA website today?